Chocolatiers is a tasty little treat - its mechanics and length are the perfect fit for those looking for something lighter and less filling to cleanse the palette on family game night. 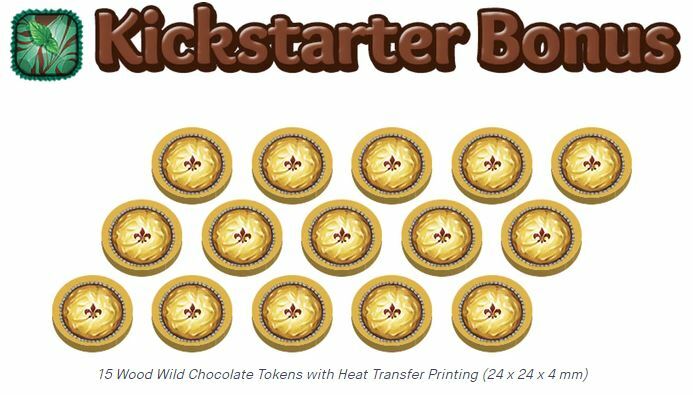 Chocolatiers, headed to Kickstarter on 1/29 (here’s a link to the preview page) is a set collection and tile laying game where players are the titular confectioners, each racing to make the most delicious – and attractive – sampler of chocolates possible! And no, before you ask, none of the prototype Daily Magic Games sent us for this preview was even slightly edible. Jess: …Don’t ask how we found out. Gameosity was provided a prototype for this preview, with the option of requesting a complete version of the game. We were not otherwise compensated. Also, since we’re in full preview mode, all images are either not final or from the Chocolatiers Kickstarter page. The goal of Chocolatiers is to make the most valuable sampler possible, and you’ll do that by boxing chocolates and placing them strategically. Each box tile is worth a set number of points, and at the end of the game, the player who made the largest contiguous blocks of each chocolate type will be awarded some bonus points (which is why you might use your wild chocolates to either fill gaps or cover other chocolate). The beginnings of a set of chocolates, just add a wild token! The game ends on the round that someone adds their sixth tile to their sampler (that player gets some bonus points for triggering the end of the game). All other players get one final turn, bonus tiles are assigned, and then a winner is declared!…and, presumably, you go get some chocolate or something. 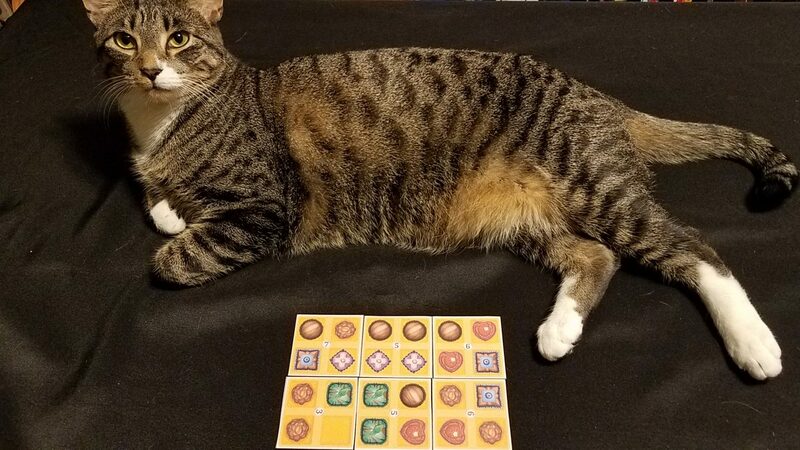 Jess: So yeah, like you said, pretty straightforward – grab the cards you need, spend them to get tiles, and artfully arrange tiles to create big sets of like chocolates. Just how I like my chocolates – easy to grasp! Andrew: Yeah, clean and simple, and indicative of Chocolatiers’ abstract heart. We’re not doing anything really chocolat-y, per se, just making sets. But that’s no problem. I really liked the simple puzzle of trying to get the chocolates I needed to make the boxes I wanted, and then planning on how I would lay them out. Our only real complaint about Chocolatiers had to do with its endgame condition – since the end is triggered by a player taking their 6th tile, it was very possible (even likely) that a player could build up a decent score and then rush towards the end of the game, punishing players who were going for rarer, more complicated chocolate tiles. Andrew: This was exacerbated by the fact that the player who ends the game gets a small bonus, and the player who has the most 3 and 4 point tiles also gets a bonus – that second bonus is meant to be a little catch-up mechanism, but it ended up sometimes rewarding someone for grabbing the cheap, fast tiles and ending the game abruptly. Jess: Yeah, I didn’t love that aspect, but that’s built into the game, yeah? And besides, the other bonuses need to be considered – you may be rushing the end of the game, but someone else is probably building better continuous sets of chocolates! Quibbles over the endgame aside, we liked Chocolatiers’ gameplay quite a bit; it’s clean and accessible, making it a great game for family game night. 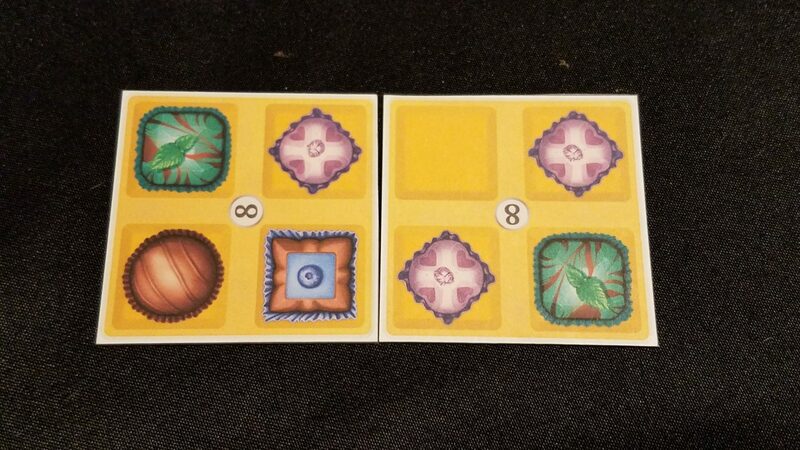 We also appreciated the artwork – the chocolates walk the line between austere and ornate, giving visual variety to the game and making it easy to scan a player’s sampler to see what sort of groups they were building up. Chocolatiers may be a filler, but the truth is there’s just enough crunchy decision-making in this set collection game to make it more than just empty calories. It’s fun, easy to engage, and quite a little treat! The Chocolatiers Kickstarter will be active soon, and when it is, we absolutely recommend heading on over to check out this tasty little treat of a game!